WHITTEMORE, Benjamin Franklin, a Representative from South Carolina; born in Malden, Middlesex County, Mass., May 18, 1824; attended the public schools of Worcester, Mass. 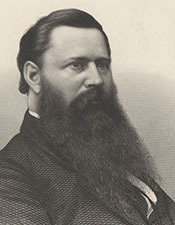 ; received an academic education at Amherst; engaged in mercantile pursuits until 1859; studied theology and became a minister in the Methodist Episcopal Church of the New England Conference in 1859; during the Civil War served as chaplain of the Fifty-third Regiment, Massachusetts Volunteers, and later with the Thirtieth Regiment, Veteran Volunteers; after the war settled in Darlington, S.C.; delegate to the South Carolina state constitutional convention in 1867; elected president of the Republican South Carolina state executive board in 1867; founded the New Era in Darlington; member of the South Carolina state senate in 1868; delegate to the Republican National Convention in 1868; upon the readmission of South Carolina to the Union, elected as a Republican to the Fortieth and succeeding Congress, served until resignation (July 18, 1868-February 24, 1870); censured by the U.S. House of Representatives on February 24, 1870, for selling an appointment to the United States Naval Academy; presented credentials for a special election to the Forty-first Congress on June 18, 1870, but the House declined to allow him to take his seat; again a member of the South Carolina state senate in 1877; resigned from the South Carolina state senate and returned to Massachusetts, settling in Woburn; became a publisher; died on January 25, 1894, in Montvale, Mass. ; interment in the Salem Street Cemetery, Woburn, Mass. Papers: In the Franklin Whittemore Papers, 1868, 3 items. Three autobiographical letters written by B.F. Whittemore from Washington D.C., to Charles Lanman and Ben[jamin] Perley Poore, two writers compiling biographical directories.